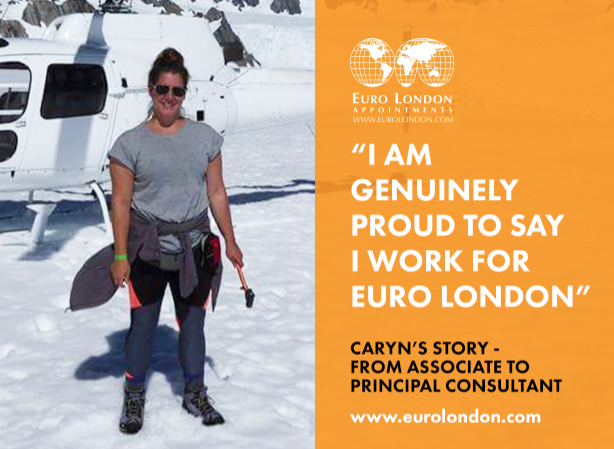 We interview Caryn Grosvenor about her amazing journey so far from Associate Consultant to Principal Consultant, and how she became Euro London’s Top performer! What were you doing before Euro London? I graduated from Aberystwyth University with a degree in Spanish and Welsh in 2007 and moved straight out to Spain where I spent a year teaching English at a university in Valladolid. From there, I spent several years back and forth between Spain and the UK working as a teacher and translator. In 2010, I decided to settle in London and started working in customer services using my Welsh language skill. A year later, I joined Euro London and I haven’t looked back! How did you find out about Euro London? I was being made redundant in my last role, so i started looking for jobs where I could use my language skills as this has always been my passion. I registered on the Euro London website and was contacted by Dawn, an internal recruiter at the time. She asked me if I’d ever thought about recruitment – which I hadn’t at the time. I did a bit of research and even though I’d never thought of myself as ‘salesy’, i thought it might be fun! Again, I haven’t looked back! Talk about your growth. Which team did you start off in and how did you get to where you are now? I have always been on the temps division at Euro London and my focus has always been London based roles. I started off on a cold desk so had to build up my client base to start with. Over the years, I have acquired clients from colleagues who have left, canvassing existing ones and also brought on many new clients. I started off in the role with no experience at all in recruitment or sales so my success is down to hard work, constant support from my managers and team, and excellent training. I’ve worked really hard and always try my best to help both my clients and candidates. I work with many different clients across many different sectors. All my clients are London based and have a need for multilingual staff. Over the years, my desk has taken on more of a focus for customer services, market research and sales roles. This is an area I love and find I’m more successful with. These days I have one main client who I am master vendor for and do all of their high season multilingual recruitment. In addition to this, I have a large number of high profile clients and also a mix of market research companies in London. You were nominated for an award, tell us more! I was lucky enough to be nominated for an award for ‘Best Temporaries Consultant’ at the Global Recruiter Awards 2014. It was such an honour to receive the nomination as I was put forward by my manager and director. On the night, I received a ‘highly commended’ mention which was incredible! It was a great evening of celebrations and I feel very lucky to have been recognised for all my hard work! Talk about your day to day life. What do you do? Never in my life have I been in a role where the day goes by so quickly! I normally get into the office just after 8am and start calling my candidates and checking them in for the day ahead. Each morning we have a team meeting where we discuss the roles that each consultant is working on and share ideas re candidates. From there the day really gets started and normally before I know it it’s 6pm!! Most days, I tend to interview between 2 and 3 candidates for our candidate pool or for specific roles. I’ll also meet lots of candidates who other consultants have brought in so I’m constantly building on my pipeline of available candidates. Throughout the day, I’ll do a mix of sourcing for live roles, canvassing for new business and keeping in touch with existing clients. It’s super varied and fast paced which I absolutely love! What makes Euro London different to other consultancies? I am genuinely proud to say I work for Euro London. We have such a great reputation amongst both clients and candidates and I feel this is due to our genuine passion, enthusiasm for our work and our integrity as a whole. It’s an absolute pleasure to be surrounded by so many multilingual colleagues and the original family vibe here really resonates with me. Coming into work here is like working amongst genuine friends but also with a healthy and fun competitiveness. The support structure at Euro London is second to none and there is always someone available to help with any issues or queries we might have. Each morning I am excited to come into the office which I think says a lot about the company! How much can a recruiter make at Euro London? The commission structure is the same across the board at Euro London whether you work on either temp or perm. We have a leader board in the office where we can see how everyone is doing and so it’s really easy to work out how much commission people are paid. When I first started this was really motivating for me. I used to look at my colleagues and people who were doing well around me and work out roughly how much they must get in commission each month! The earning potential at Euro London is massive. As top biller, most years I more than double my basic salary in commission and there are loads of incentives and bonuses too. To put it bluntly, if you work hard you can earn a crazy amount of money!!! We have so many incentives and perks at Euro London – where do I start!? From lunch club, darts challenge where we win what we throw and beat your best (£15 vouchers every time you beat your best month) getting a ½ day off on a Friday if you hit your monthly to target and also having your birthday off work! The list is endless! There are lots of incentives that are very achievable from day 1 and then those which are a bit more challenging but seriously rewarding! This includes those such as ‘Business with Pleasure’ where we get to go and work in one of the other offices and have travel and hotel paid for + an extra day off. ‘Quarterly top biller club’ where we get to dine in style with other colleagues and a ½ yearly weekend away! Last but not least we have the TROPICAL HOLIDAY! This is the annual target and there are 4 different levels of this that you can reach. They are all incredible and you basically get to go on your dream trip paid for by Euro London! I could go on and on!! My friends and family can’t believe it when I tell them all the incentives and perks I get at work! I’ve worked my way up over the last 6 years from associate consultant to principal consultant and I’m really happy in my role. What I enjoy the most is having control of my own desk and my own billings as well as working as part of a fantastic team in a fantastic company!! I can genuinely see myself working for Euro London for a long long long long time. Every day is a new adventure and it’s an absolute pleasure working with such great people and meeting so many interesting people on a daily basis. Thank you Euro London!! I think the key to success at Euro London is perseverance, hard work, positivity and having a genuine passion for the company and language recruitment as a whole. If you can channel that passion into helping clients to find the best candidates and helping candidates to find their dream role or roles that will help them get to where they want to be – you’re winning! The Extra Miler Award for October 2017 goes to..